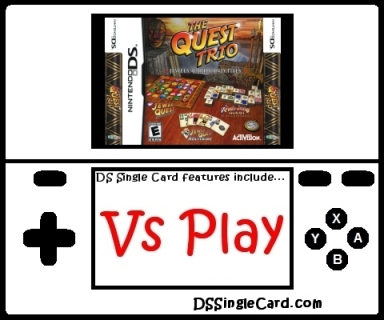 The Quest Trio and Jewel Quest Expeditions are identically the same when it comes to Single-Card Download content: The Quest Trio is a single Nintendo DS game chip that features three games. One of those games is Jewel Quest Expeiditions (it is identical to the stand-alone Nintendo DS version of the game in every way, not just in terms of Single-Card Download). The other two games ("Jewel Quest Solitaire" and "Mahjong Quest Expeditions") do not feature any Single-Card Download content. While it is quite obvious that getting three games instead of one (especially when they are priced the same) is a better value, this site only reviews Single-Card Download features. Since those features are identical, the reviews are identical (the words "as part of The Quest Trio" were added after referencing Jewel Quest Expeditions). Jewel Quest Expeditions (as part of The Quest Trio) is very easy to navigate. "Wireless" is right on the main menu and guests can then begin connecting. The opening credits sequence is mostly skipable and the download time is respectably appropriate. The menus are clearly written, appropriately spaced, and accept input tapping just like they're supposed to. Everything works fine here. The gameplay consists of a single mechanic: dragging. Dragging a jewel from one space to a different adjoining space. That's it. Simple, isn't it? The play control is excellent and is as accurate as each player's aim. The small downside is that there is no variation, but in this game variation isn't needed. If the players are paying attention, things go exactly as expected. The jewels, while small, give the impression of being somewhere in between 2D and 3D. Everything else is in 2D. There's nothing wrong with the graphics, they're just simple (intentionally). Sound is a nice mix of background music and sound effects that isn't required but does set a nice "adventure" mood. In a simple puzzle game, Single-Card Download is almost a no-brainer if a multiplayer mode (or a demo) can be arranged. While there is no demo available, there are three different multiplayer play modes to choose from and all three come together (and it's still a respectable download time). While they are a little short, there's enough variation in them to play through them all (multiple times). The quickest increasing demographic among gamers world-wide is the "Casual Gamer" demographic. Casual gamers are people that play games for fun (not competition), enjoy playing their games when they only have a few minutes (they may - or may not - enjoy long, in-depth gaming experiences), and prefer games that can be played through more than once with an equally-enjoyable experience each time. Jewel Quest Expeditions (as part of The Quest Trio) is portable (Nintendo DS), can be played in only a few minutes, and doesn't require anyone to remember intricate plot lines or character names. It's a fun puzzle game (from a well-respected series) that can be played over and over again and the experience is virtually the same each time (no loss of enjoyment due to already knowing the plot secrets). I enjoyed Jewel Quest Expeditions (as part of The Quest Trio). I found no programming flaws or glitches. I found no real problems of any kind. Sure, I would have enjoyed a lot more variety in the different multiplayer playing modes, selectable time limits and jewel sets, and the inclusion of a demo. What I got, though, was still a very enjoyable puzzle game. A lot of the gaming web sites are treating Jewel Quest Expeditions (as part of The Quest Trio) like yet another throw-away, budget bin title, but I believe that Jewel Quest Expeditions (as part of The Quest Trio) stands up on its own as a fun game that fans of the series will find quite enjoyable. If puzzle games ain't your "thang" when playing on a Nintendo DS, well... why are you even reading this review? If you enjoy puzzle games but have never played a Jewel Quest title, Expeditions is a great place to start. I can tell you that I will definitely be playing this one again. Allow the host to decide which gems to include prior to the download. Permit the host to select the time limit for the Points mode. Provide an endless mode option for a Single-Card Download demo. Include a 3D mode (or at least a 3D level). Click here to return to the DSSingleCard.com The Quest Trio profile.